We offer a variety of classes for different ages and interests. Don't see one you like? Talk to Pastor Mark about starting a new one! The Motley Crew: This class is comprised of adults (singles and couples) in their 20's and 30's who are seeking an enriched spiritual life. We also offer a safe environment to ask tough questions and work together to try and make sense of those things that just don't make sense. The curriculum is designed around the changing spiritual needs of those want to participate, and has included lessons on balance as well as videos by Rob Bell. The class is led by Susan Sirnic, and meets in the Chapel (which is on the office-level, next to the Music Room). The Open Door (Bible Class): Curriculum varies from year to year, based on the class's preference, but we are currently studying the current week's Bible passages (from the United Church of Christ's yearly schedule). This makes it easy to come and go from week to week, since each lesson is individual, with little to no carryover from the previous week(s). Our class is led by Andy Ozete. Most of the members of this class participate in our Y2K fellowship group, and have multi-child families. YAC: The YAC class explores the influence of current events on our faith journey, and how cultural, economic, and political trends affect our efforts to follow teachings of Jesus. We are presently meeting in the southwest (back right) corner of the Fellowship Hall. Steve Worthington is the primary leader of this group. All are welcome! Discovery: The Discovery Class is a mixed age group that does in-depth Bible Studies, following the Lectionary readings each Sunday. They share leadership and encourage participation by all members and visitors alike. They meet in the Library (between the Fellowship Hall and Welcoming Area, across from the kitchen). Eosin: Eosin Sunday School class meets in the northwest corner (immediate right) of the Fellowship Hall on Sunday mornings. We discuss modern topics that impact our lives and our society connecting the topics to Christian values and Bible scriptures. We have discussed this year: miracles, prayer, choosing Godly values, and character traits. You do not have to be a Biblical literate to be part of this fun-loving group and the discussions! Most of our class participants are also part of the Eosin fellowship group. This class is led by Debbie Havens. Bible Study: The Bible Study Class examines scripture to explore its meaning, place in history, and geographical locations. We then relate the Bible to our everyday life. Although this group is comprised of retirees, we believe the Bible is for all ages. 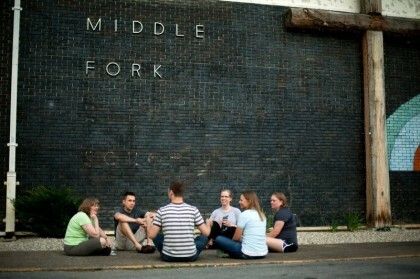 This class meets in the southeast (back left) corner of the Fellowship Hall.